The government has abandoned the original centerpiece of its $700 billion rescue effort for the financial system and will not use the money to purchase troubled bank assets. Treasury Secretary Henry Paulson said Wednesday that the administration will continue to use $250 billion of the program to purchase stock in banks as a way to bolster their balance sheets and encourage them to resume more normal lending. He also announced that the administration was looking at a major expansion of the program into the markets that provide support for credit card debt, auto loans and student loans. Despite shifting from the original plan, Paulson insisted he did not mislead Congress, reports CBS News business correspondent Anthony Mason. "I will never apologize for changing an approach or strategy when the facts change," he said. Paulson said 40 percent of U.S. consumer credit is provided through selling securities that are backed by pools of auto loans and other such debt. He said these markets need support. Under the bailout plan, 52 financial institutions have received approval for about $172 billion so far, reports Mason. In an open letter Wednesday, the Fed reminded the banks to "ensure that the needs of creditworthy borrowers are met." In other words - lend the money. On the issue of using the $700 billion bailout package to provide help to ailing auto companies, Paulson said the administration preferred an approach that would accelerate support to that industry from other legislation Congress passed this fall. Paulson said the administration is exploring other options, including expanding the program beyond banks to nonbank financial institutions which provide essential credit to both businesses and consumers. He suggested that capital could be provided to institutions on a matching basis in which the government would supply money to those able to raise money on their own. Providing an update on the largest government bailout in U.S. history, Paulson said that the effort was showing results but that more efforts were needed given the most severe downturn being faced in housing. 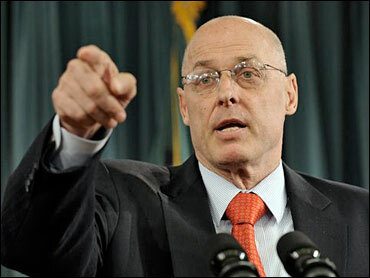 "Our financial system remains fragile in the face of an economic downturn here and abroad," Paulson said. "Market turmoil will not abate until the biggest part of the housing correction is behind us. Our primary focus must be recovery and repair." The bailout money also should be used to support efforts to keep mortgage borrowers from losing their homes because of soaring default levels, he said. A proposal to have part of the bailout funds used to guarantee mortgages that have been reworked to reduce monthly payments for borrowers is an approach the administration continues to discuss, Paulson said, although he indicated it would not be a part of the rescue program. He said it went beyond the intent of the legislation Congress passed on Oct. 3. More than 4 million American homeowners, or 9 percent of borrowers with a mortgage, were either behind on their payments or in foreclosure at the end of June, according to the most recent data from the Mortgage Bankers Association. Joanne Lipman, editor in chief of Conde Nast Portfolio Magazine, told CBS' The Early Show that struggling homeowners should work with banks. "What you have to do is let your bank know, first of all, before you miss a payment," Joanne Lipman said. "Secondly, let your bank know you want to stay in your house. This is key. If you want to stay in your house, your bank wants to work with you." Asked about what he had in mind to expand the rescue effort to support credit card and other types of consumer debt that is backed by selling securities, Paulson said it would probably take weeks to design the new program and then more time to get it implemented, a possible sign that any such proposal would have to be implemented by the incoming administration of President-elect Barack Obama. Speaking of the first-ever summit of leaders of the Group of 20 major industrial and developing countries, Paulson said this weekend's meeting needs to focus first on how to repair the financial system as a way to bolster the global economy. Elsewhere, Paulson praised a new set of guidelines issued Wednesday by the Federal Reserve and other bank regulators, saying that they addressed a crucial issue of making sure that banks continue to lend at adequate levels. The guidelines urge institutions to continue lending to credit worthy borrowers and to work with mortgage borrowers to avoid defaults. In addition, the guidelines encourage the banks to set dividend payments for shareholders and compensation for executives with the current crisis in mind. The guidelines address criticism that banks obtaining funds from the $700 billion rescue plan could simply use the money for their own purposes rather than helping struggling homeowners and the overall economy. Critics are concerned that banks, which are getting $250 billion through government purchases of their stock, are not using the money to boost lending to customers, one of the main reasons why the economy is in a crisis. "If underwriting standards tighten excessively or banking organizations retreat from making sound credit decisions, the current market conditions may be exacerbated, leading to slower growth and potential damage to the economy," according to the regulators' guidance. The Fed, Federal Deposit Insurance Corp., Office of the Comptroller of the Currency, and Office of Thrift Supervision said all financial institutions were expected to follow the new guidelines, even those not receiving federal assistance. The Bush administration already has committed $250 billion of the $700 billion rescue fund for the purchase of bank stock, giving financial institutions an infusion of cash the government hopes they will use to resume more normal lending operations and address the most severe credit crisis in decades. On Monday, the administration announced that it was allocating another $40 billion as an investment in troubled insurance giant American International Group. Those decisions leave only $60 billion of the initial $350 billion left to allocate. To access the second $350 billion, this administration or the next will have to make a request to Congress for the money.